If we were playing summer food word association, ‘grilling’ clearly would top the list. Along with fresh, simple food, casual dining and a host of seasonal ingredients that define the season’s flavor palette. My personal food choices in the hotter months focus much more on the vibrant flavors and less on the laborious preparation that seems to suit when there is a chill in the air. I love the chance to think outside the ‘recipe box’ if you will. I wanted to make something simple, yet innovative. 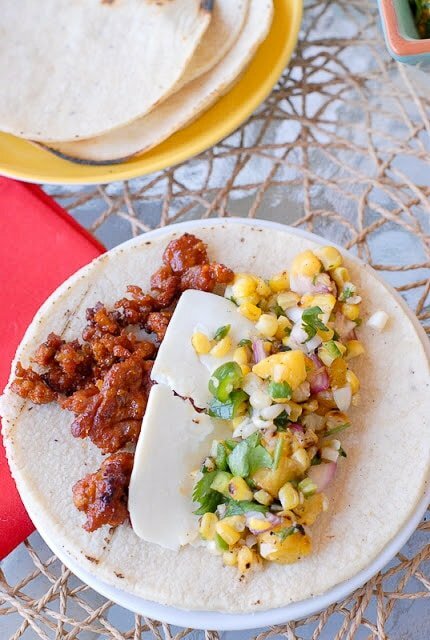 I decided to make Smoked Chorizo Soft Tacos with Grilled Salsa feeling it highlights the preferred summer cooking method, signature summer flavors and the ease we enjoy about summer dining. Though I own a smoker, I chose to smoke some chorizo sausage in a manner anyone with a grill, gas or charcoal, could repeat themselves. It’s definitely a method that could be used with many other foods. 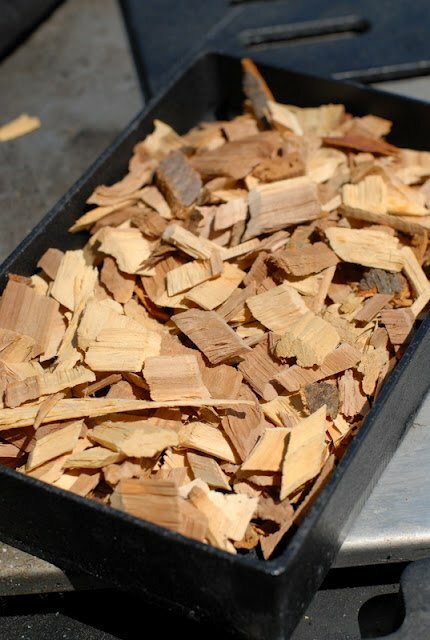 There are many methods to add special wood to grilling to enhance the flavors of whatever is being cooked. With a charcoal grill, it’s very simple to put the wood in with the charcoal. 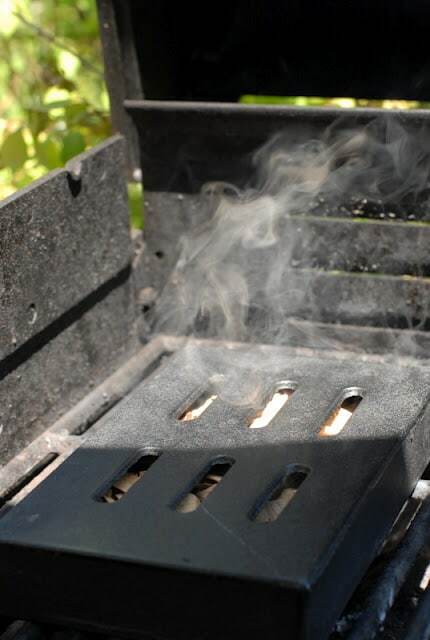 A gas grill is a bit trickier although there are inexpensive options to buy, or DIY fixes as simple as creating a smoker packet out of heavy duty foil. In my case I married my desire to do something unexpected with the chance to try out a new grill accessory: a cast iron smoking box. Purchased for $10 online, I loaded the box with apple wood. As the box gets hot, the wood inside begins to smoke. 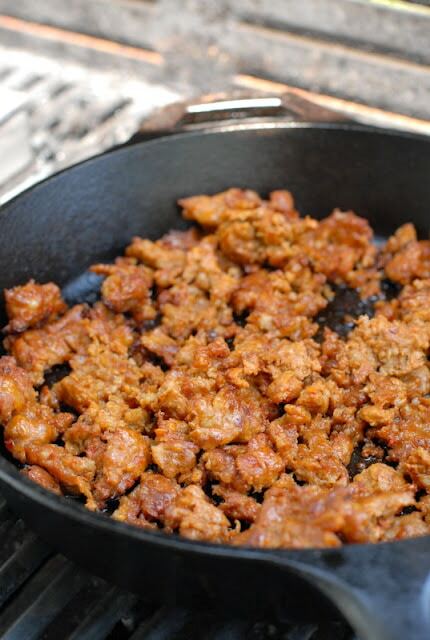 Since I used loose chorizo, I places it in a cast iron skillet to cook and smoke it in the closed grill. 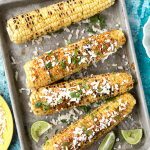 It created a wonderful smoked flavor that was delicious in the soft tacos with grilled peach and corn salsa, as well as light flavored Mexican cheese! Smoking sausage on the grill is a fun alternative to regular grilling and does not take much effort. 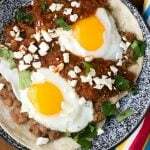 These tacos are simple and casual but far from ordinary. 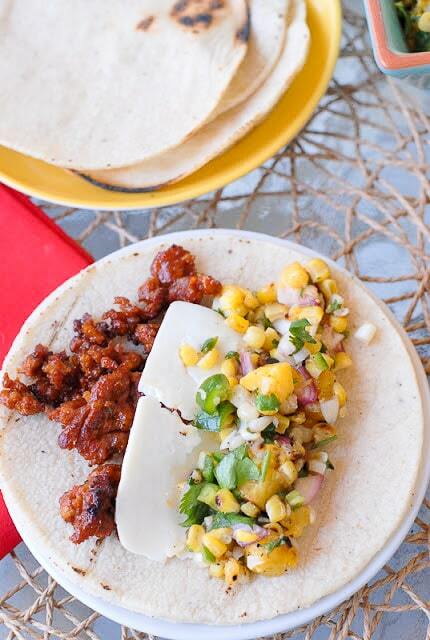 The smoked heat of the chorizo coupled with the cool, sweet salsa makes for a flavorful summer celebration! 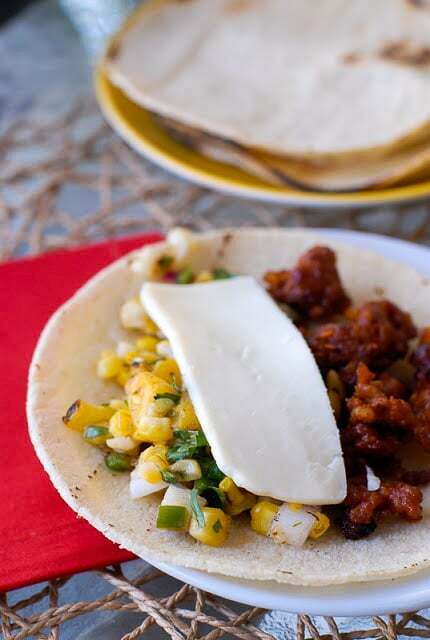 Queso Fresco cheese is a light, mild Mexican cheese that blends perfectly with the flavors. 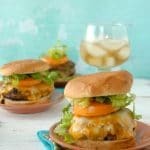 It does not melt in the same way as traditional cheese but softens with the heat of the grill-smoked chorizo. Preheat half of the grill to high heat. Leave other side of grill turned off. Keep hood lowered. 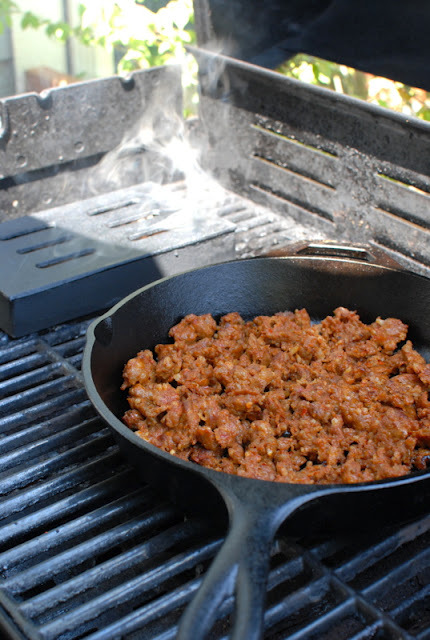 In an oven proof skillet (I used cast iron), lightly brown the chorizo on the stove top or on a grill burner if your grill has one. Drain any grease (mine did not have any). Prepare the smoking packet I used a cast iron grill smoking box I purchased for about $10 on Amazon.com. You can also make a smoking packet by placing the apple wood in a large square of heavy foil. Close packet by folding over edges. Pierce the top of the foil in several spots. Place the smoking packet on the heated side of the grill. Close grill lid and allow to heat up and begin to smoke (about 10-15 minutes). Leaving smoking packet on the grill, add the chorizo in the oven proof skillet on the side of the grill that was not heated. Close grill hood and allow to smoke for 15 minutes. Remove chorizo and allow to cool slightly. 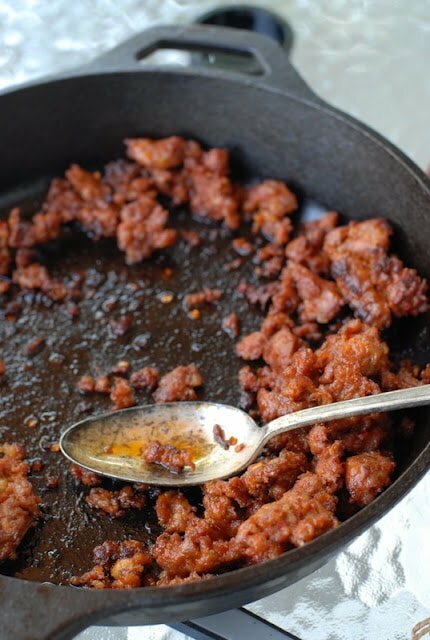 Drain any fat or use a slotted spoon to dish chorizo into tacos. Remove smoking packet and allow to cool fully before discarding (or discarding the wood if using a smoking box). To warm tortillas: Place tortillas in heavy foil and seal. Place packet on the grill to warm for a few minutes after removing chorizo and smoking packet. 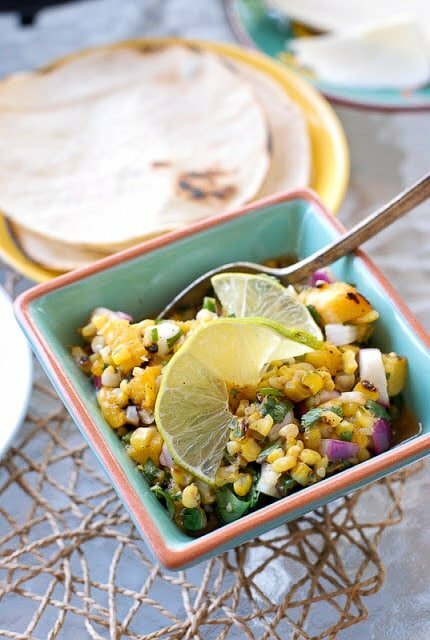 To assemble tacos: In a warm tortilla, add two spoonfuls (soup spoon size) of chorizo, a slice of queso fresco and a large spoonful of the Grilled Peach and Corn Salsa. Enjoy! I think everyone is looking at this with a big hunk of drool dangling from their mouths. Looks freakin' amazing! Toni, the colors and textures you've implemented here can only be described as vibrant! What a charismatic, delicious meal! This is simply droolworthy with smoked chorizo! Oh my gosh-yum! These look terrific in everyway! Toni, Nice work on these tantalizing tacos! Big smile when the smoker box was revealed…I have the same one. 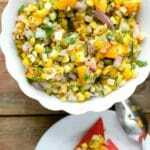 The chorizo choice is spot on and the balance of texture, color and flavor from the peach and corn salsa seals the deal. Best wishes on the contest, I'll stop by and visit the sausage company's FB page. Hi Brooks! A kindred smoker friend (another overlap we've found!). I am guessing you've had great success? I found it so easy to use and am excited to try other things with it now. Thanks for the kind remarks on the dish too! Would love your vote, thank you! I could almost smell this. Wonderful grilling tips. Thank you Rosemary! I hope you'll try it so you can really smell them….and taste them too! 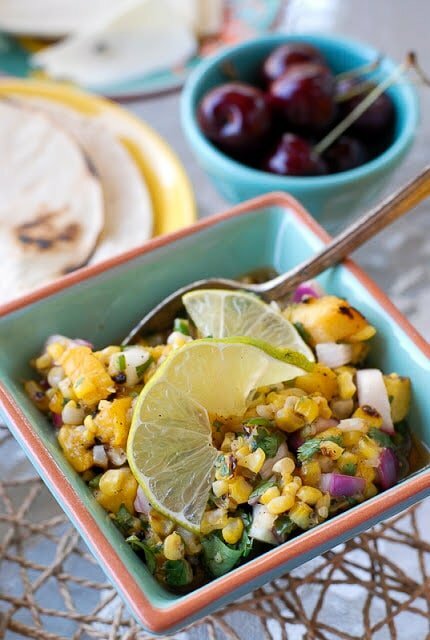 amazing flavors here.. peach and salsa …nice one! That grill smoking box is really nice. I usually use the aluminum foil method, but I should look into getting that box. Anyway, really nice recipe. Great way to use chorizo. And I'll eat a soft taco any day of the week. Very good post – thank you. Thank you. The box is really great. It literally was around $10 (I can get you the link on Amazon if you are interested) and is about the size of a VCR movie (do people still remember those?!). It worked perfectly and since it's cast iron it is very hardy. I highly suggest it! 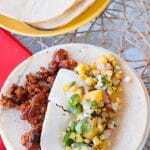 I am with you on soft tacos and was really pleased with the flavor combinations of these tacos. 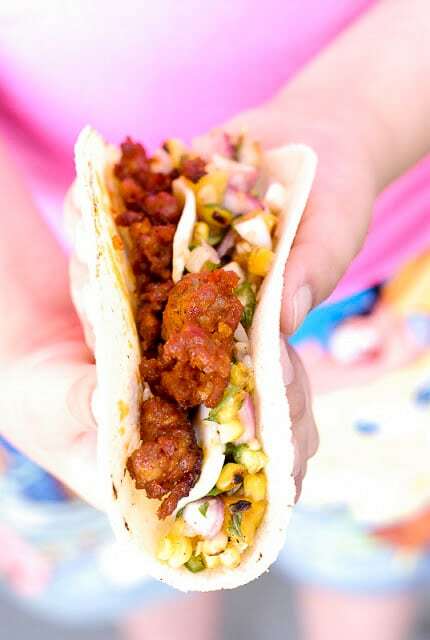 Fabulous taco Toni. I'm a fan of Boulder Sausage, and didn't realize they made chorizo. Don't think my Safeway carries it. I'm going to have to venture out and find some. Hi Lea Ann. Maybe check the Boulder Sausage website for 'where to buy'? It really is high quality sausage. We've enjoyed all the types they make and of course love that it is local!